Getting blue screen in 70% cases when i start the game and then selecting the server to connect to. 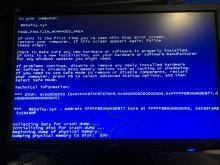 BSOD appears right after the game tries to connect: Double click to server name, then the sound stucks, everything including mouse cursor frezes for a second and then BSOD appears. I've read a lot of articles with other BSOD bugs and tried options to fix that: fix files with steam, reinstall the game or whole windows, change compatibility mode for exe files, refresh or even downgrade drivers - nothing works for me. I've also tried an option to replace BEService_x64.exe with other one downloaded from some of your resources. After that the game stopped to cause BSOD, but every try to connect to server was also failed - the game just halted and then restarted again (opened with main menu). Hello anton.dukhanin and thank you for the report. Can you please provide us with a dxdiag file from your computer? A fix is being worked on by the BattlEye team.